ALISO VIEJO, Calif. /California Newswire/ — On Thursday, August 6, Liberty Lives and Council for Vaccine Safety will co-sponsor a film screening of the powerful, eye-opening documentary "Trace Amounts." An expert Q&A panel will directly follow the film and include "Trace Amounts" producers Eric Gladen and Shiloh Levine, well-known local pediatrician Dr. Bob Sears, investigative journalist Lori Martin Gregory, civil rights lawyer George Fatheree and former Merck representative Brandy Vaughan, founder of Council for Vaccine Safety. The film is free for all media. A pre-movie mixer, including appetizers, offers the rare opportunity to speak with panelists and others in the community before the film. Thursday, August 6, 2015, 7:30 p.m.
Edwards Aliso Viejo Stadium 20 and IMAX. 26701 Aliso Viejo Creek Rd, Aliso Viejo, CA 92656. Pre-movie mixer next door to theater: 6 p.m. at Stadium Brewing Company. Q&A panel discussion directly following film. "Trace Amounts" follows Eric Gladen as he searches for the truth after suffering a severe reaction to a tetanus vaccine at age 29. He finds that these reactions are far more common than most realize and have wreaked havoc on the health of Americans. Eric discovers a myriad of deceptions within the U.S. healthcare industry and the government, that prove our vaccine program is more about profit than public health. Throughout his two-year journey into the depths of the U.S. vaccine program, Eric interviews many healthcare experts including doctors, researchers and health officials as well as families with children that suffer from the same reaction as Eric did – mercury poisoning from vaccines. He uncovers the many lies portrayed as truth to the American public. He questions why pharmaceutical companies are allowed to continue putting mercury – and other known heavy metals and toxins – into vaccines that are then passed off as safe, when there is clear scientific evidence that shows these additives are linked with neurological disabilities, autoimmune diseases and even cancer. 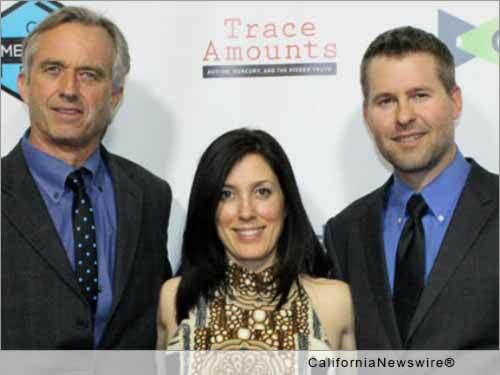 "Trace Amounts" is an extremely important film as mandatory vaccination laws are being proposed throughout the country. One of the strictest vaccination laws in the country, SB277, was signed into law by Governor Brown in June, eliminating all personal belief and religious exemptions. It requires a full 35 vaccine doses, including vaccines for non-communicable diseases like tetanus, before children are allowed to enter public or private school. Also under SB277, children will not be allowed to attend preschool or daycare without being up-to-date on the full schedule of vaccinations – selective or delayed vaccination will not be allowed. With the passage of SB277, California joins two other states – Mississippi and West Virginia – that enforce the strictest vaccination laws in the country. These two states also have some of the highest rates of infant mortality as well as other childhood diseases and disabilities including SIDs, allergies, autoimmune issues, autism, speech delays, ADHD, type-1 diabetes, leukemia and asthma. SB277 puts Californian children at risk of following suit as the childhood vaccine schedule continually increases and as more toxins are used within the vaccines as adjuvants and preservatives. With 53 recommended vaccines doses by kindergarten, the U.S. already leads the world with the most intensive vaccination schedule, giving 2-3 times more vaccines to its children than other developed countries. The U.S. gives 26 vaccine doses before age one, yet has the highest infant mortality in the developed world (despite spending more on healthcare per capita than any other country). Currently under California law, children who actually carry diseases such as Hepatitis and HIV are allowed in public and private school and cannot be discriminated based on their health conditions. Yet children who are healthy, and do not carry these diseases will not be allowed in either public or private school. This infringes on the rights of Californian children to free public education without discrimination, as per the California Constitution. Discrimination includes discrimination based on health status. Vaccines have never been studied for safety in combination, yet 6-9 doses are routinely given during childhood doctor visits. Many vaccine additives, such as aluminum, MSG and formaldehyde, have been repeatedly linked to neurotoxicity, auto-immune diseases and cancer. Currently in the U.S., vaccines are the only product that has complete liability protection, meaning if you or your child is injured or killed by a vaccine, you cannot sue the vaccine maker. While SB277 targets children and their fundamental right to a free public education, lawmakers are also planning mandatory vaccination laws that will apply to college students, hospital workers, school staff and, eventually, the entire adult population. The film is free for all media. To purchase additional tickets, please visit: http://gathr.us/screening/12527. Council for Vaccine Safety, founded by a former pharmaceutical representative, is a non-profit organization focused on education and public awareness of vaccine risks while advocating for safer vaccines and medical freedom, a fundamental right. More information: http://councilforvaccinesafety.org/. Liberty Lives is a group of like-minded individuals that are standing up to continue and regain our natural-born liberties under the premise that all are created equal. We believe in freedom of health, the right to education and individual liberties for all. VIDEO – Trailer for "Trace Amounts" (YouTube): https://youtu.be/sqqiy8DhyH0.